Dinesh is the only child for his parents. He is a very friendly and enthusiastic person. When he was as young as 3 1/2 years, he lost one of his legs in an accident that occurred in Tirupathi. 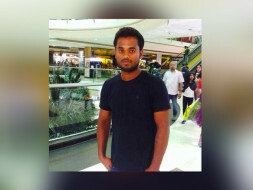 During Dinesh's engineering days, he was detected with cancer, it was removed subsequently through surgery. Sometime around last month, Dinesh was detected with cancer again - cancer has affected his liver and throat. Doctors recommended chemotherapy twice a month for 3 months. 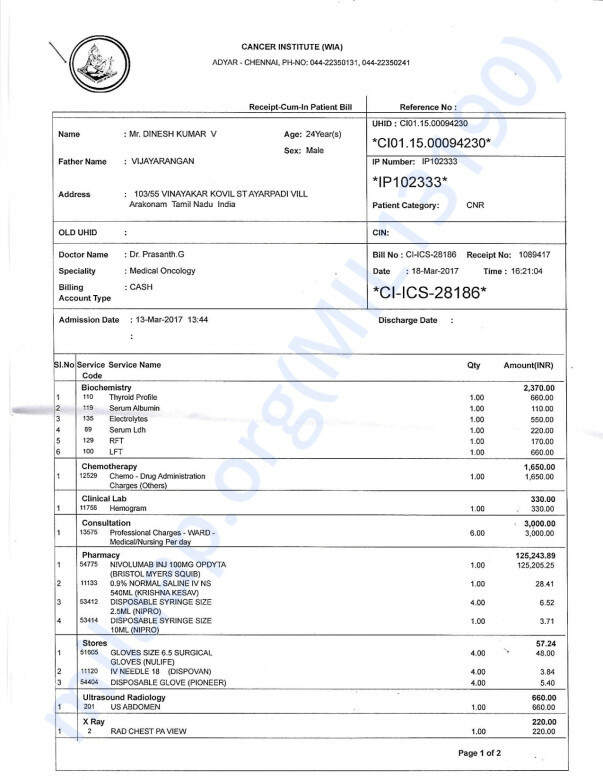 One time dosage cost is around 1.25 lakhs. This needs to be completed for him, for a total of 6 times. Unfortunately, we have some sad news to share with you, Dinesh passed away on 31st May. 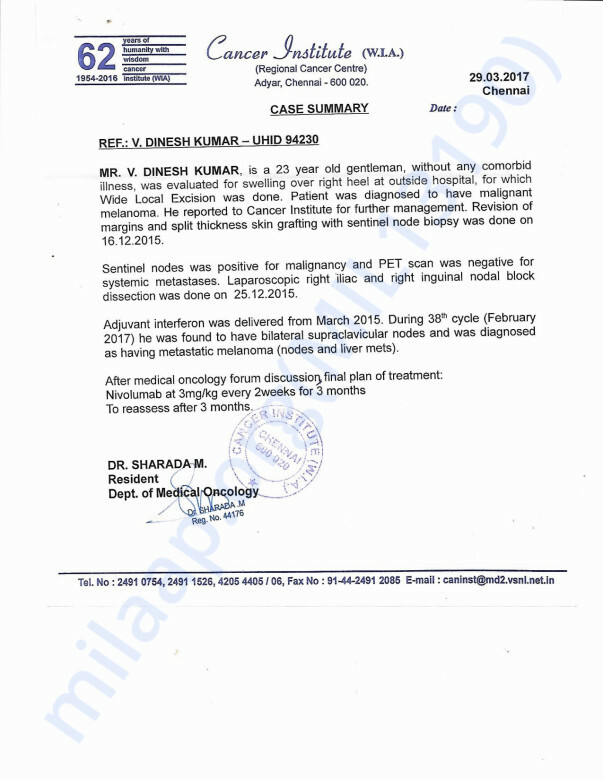 He was undergoing treatment for cancer and the side effects of which were very severe. He had completed 4 dosages of the treatment. He was being treated for the same but he suffered a cardiac arrest during the treatment. The family is really thankful to everyone. We hope that the family finds strength in this difficult time. Thank you so much for everyone! timely help. 3rd dosage done on last Saturday 11th April 2017. 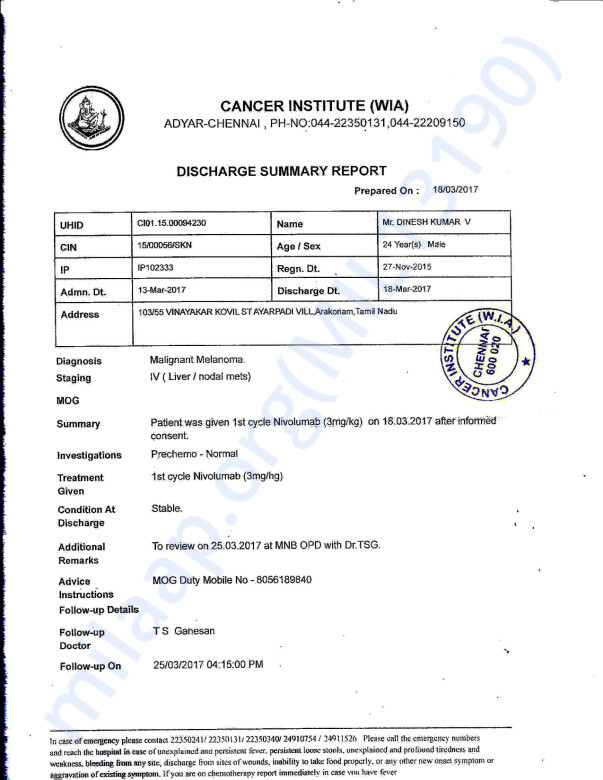 INR 77,500 and USD 201 withdrawn and paid it for third dosage. Thank you so much for timely help. On behalf of Dinesh - Bala.